ShelterBox is made up of people who believe in shelter as a human right – that shelter from the chaos of disaster and conflict is vital. When people are plunged into crisis, normality is suspended. But good, quality shelter can cut through the chaos. This is why we provide the tools that enable people to rebuild homes and transform their lives. We do things differently. We started life as a small organisation in rugged West Cornwall in the UK and have grown to make a big impact across the world in the last 18 years. Since our establishment in 2000, we have provided shelter for more than 1.3 million people affected by humanitarian emergencies. In the last five years, we have responded to 132 humanitarian emergencies in 103 countries affected by rapid on-set disasters (cyclones, hurricanes, typhoons, floods, landslides, earthquakes, and tsunamis) and chronic crises (drought and conflict). We are impatient to see a world where no family is left without shelter when disaster strikes. This drives us to transform the support of our donors, fundraisers and volunteers into the hope and power of families all over the world - the power to rebuild homes, lives and communities. Our impatience leads to determination. We will do whatever it takes to ensure that no family goes without shelter. We work hard to understand the impact of each emergency and the need this creates within individual communities. We don’t believe that one size fits all. The support we provide, whatever shape it takes, gives people the hope and the power to transform their own lives. Our sturdy green ShelterBoxes are designed to help people who have lost everything – not just their home and precious belongings, but practical tools and utensils that create the framework for everyday life. They contain a family-sized tent that protects people from the elements and provides a safe space in which people can start to recover from physical and emotional trauma. The contents differ depending on the disaster and the climate, but items such as solar lights, water storage and purification equipment, thermal blankets and cooking utensils help start the process of creating a home. We deliver the essentials families need to begin rebuilding their lives after disaster. Each disaster is different, and so is every community. We don’t believe that one size fits all, so we spend time talking to affected families to make sure we provide the right support at the right time. For some disaster-hit communities, our family-sized tents are the best solution until they are able to start rebuilding their homes. In other disasters, heavy-duty tarpaulins, ropes and nails are needed to create emergency shelter or to patch-up damaged buildings. Sometimes we even include corrugated iron to make resilient roofing, or mattresses to make warehouses habitable – whatever it takes to help people recover from disaster. We know that a home is much more than bricks and mortar or tarpaulin and tent pegs. That’s why we also offer other disaster relief items that are essential for survival and can help to turn a shelter into a home. Our ShelterKits contain a selection of materials, including toolkits, ropes, fixings and heavy-duty tarpaulins, that can be used to make emergency shelters, repair damaged buildings and create the foundations for new homes. We also customise these kits to suit the location and the needs of each community. Sometimes the kits include corrugated iron to help make resilient roofing, or even room dividers and mattresses to make warehouses habitable – whatever it takes to help people recover from disaster. "competition" in terms of deployment. Note the comparison table at the end of this page. 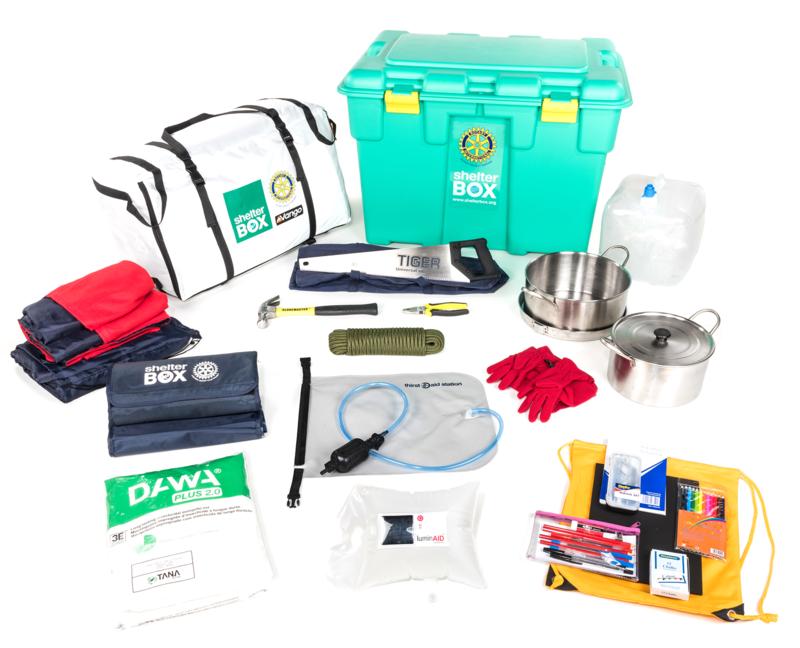 Clubs should consider purchasing, or making a donation towards purchasing both Rotary Emergency Response Kits and ShelterBoxes. Each is different, but they are complementary. Emergency Response Kits (ERKs) - Rotary New Zealand’s (World Community Service) overall response to disasters. ERKs are used as first-response survival kits in emergencies in the South Pacific Islands, can be carried by hand and provide essential items for immediate basic needs for people to be able to camp in their damaged homes whilst they get on with cleaning up and re-establishing themselves. ShelterBox is an international disaster relief charity that delivers emergency shelter, warmth and dignity to people affected by disaster worldwide. ShelterBox is a Rotary Project Partner of Rotary International in Disaster Relief. Each ERK contains essential household cooking, eating and cleaning items, clothing, tools, toilet and medicine items. We have now changed to a new RNZWCS single NZ standardised Filled Plastic ERK, which has a tap and can be used to hold water or food. ShelterBox aid is tailored to a disaster but typically includes a disaster relief tent for family, thermal blankets and groundsheets, water storage and purification equipment, solar lamps, cooking utensils, a basic tool kit, mosquito nets and children’s activity pack. Over 1200 ERK’s were distributed well before other aid after the 2009 Fijian Floods & Samoan Tsunami, the 2010 Cook Islands & Fiji cyclones. In January 2012 over 400 ERK’s were distributed immediately after the Fiji Floods from stocks held by local Rotarians. Prepositioned stocks of ERK’s are held in readiness by Rotary Clubs in Samoa & Fiji for immediate distribution when needed with backup & replenishment stocks of ERK’s held in Auckland & Christchurch ready to be air lifted by the NZ Government through NZ AID to any disaster areas in the South Pacific. Over 135,000 ShelterBoxes have been delivered worldwide, assuring shelter for well over 1 million displaced people. ShelterBox has boxes in strategic locations around the world, either key transportation hubs or locations that are close to areas where we regularly deploy. These pre-positioned boxes are in places like Dubai, Singapore, Melbourne, Panama, Curacao and Nairobi. ShelterBox is also part of the United Nations Humanitarian Response Depot (UNHRD) network, which holds emergency relief goods in warehouses in five continents. Having pre-positioned aid significantly reduces our response time. ERKs first introduced to New Zealand in 1983 as Emergency Boxes by the Rotary Club of Eastern Hutt, were enthusiastically endorsed by then District 9940 Governor and now Past RI World President Bill Boyd. 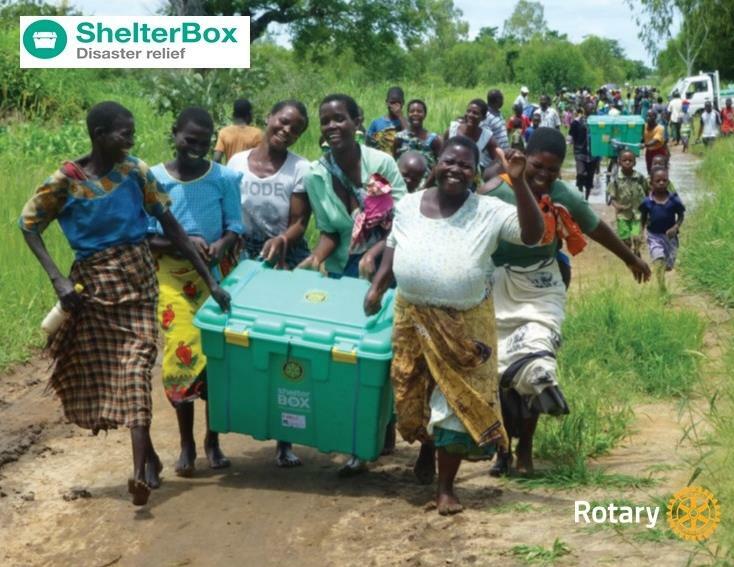 ShelterBox was founded by a UK Rotarian in April 2000. It now has affiliates in 18 countries. In New Zealand ShelterBox is administered by the ShelterBox New Zealand Charitable Trust and is supported by the Rotary Clubs of New Zealand.